Celebrating the legacy of the Dark Knight, DETECTIVE COMICS: 80 YEARS OF BATMAN follows the best-selling ACTION COMICS: 80 YEARS OF SUPERMAN. Over the past eight decades, Batman has remained at the forefront of popular culture, which is in no small part because of this comic book series that is synonymous with the Dark Knight! Celebrate DETECTIVE COMICS with DC, as we revisit classic stories from comics from the 1930s onward, featuring some of Batman's greatest allies and villains and work from some of the greatest creators ever to grace the graphic-literature medium! Curated by guest editor Paul Levitz, it features reprints of the Dark Knight's most memorable adventures, from his first appearance to the debuts of Robin, Batwoman, Bat-Mite and Batgirl, as well as villains including Two-Face, the Riddler, Clayface, Man-Bat and more. This hardcover also spotlights crime-fighters including Slam Bradley, Air Wave, the Boy Commandos, the Martian Manhunter and the 1970s Manhunter, Paul Kirk! And, published for the first time anywhere: a new tale of a traumatic early moment in Bruce Wayne's life written by Paul Levitz with art by Denys Cowan and Bill Sienkiewicz, and an extraordinary look at a long-ago work in progress-the original layouts for the Batman tale from DETECTIVE COMICS #200, as illustrated by Lew Sayre Schwartz (and signed 'Bob Kane'). 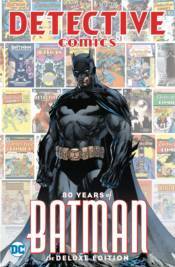 As if that's not enough, this volume includes essays on Batman from contributors including Cory Doctorow, Neil Gaiman, Glen David Gold, Dennis O'Neil, former San Diego police chief Shelley Zimmerman and pulp historian Anthony Tollin. With a new cover by DC Publisher and Chief Creative Officer Jim Lee, These stories will be accompanied by breathtaking essays from some of the best writers of our time about how Batman has affected their work and American culture at large. Be here for the celebration of the year!